This resource features the general description of a warehouse docking bay for a prototype vessel. 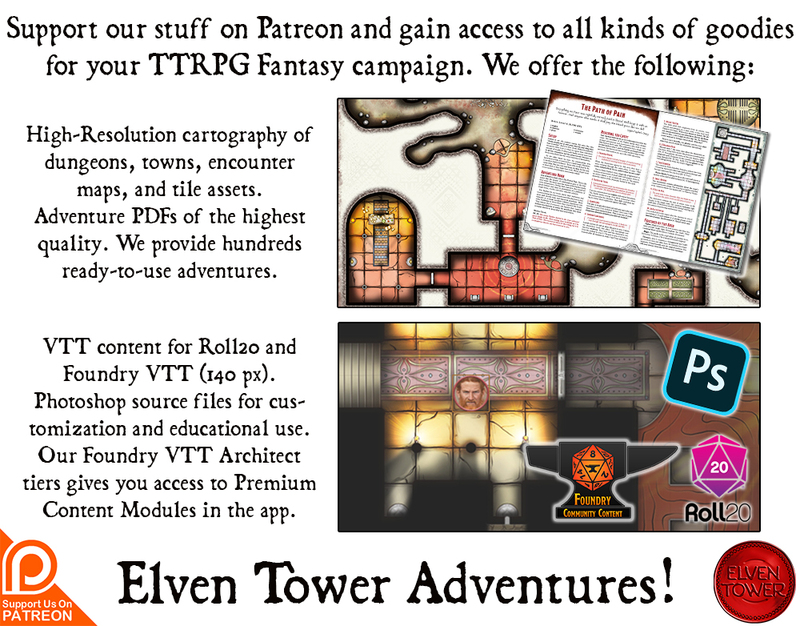 It includes adventure ideas that are appropriate for low to mid-level (Levels 1 to 8) adventur­ing parties. Challenge Rating (CR) is calculated using a party of four as the model. It is not that magic was rare or that people did not believe it was possible, at least in theory. It was more of a judgment of Darthan’s abilities and character. Darthan rose to prominence in the city’s social horizon six years ago when he tried to perform at the city’s annual fair. His intention was to raise funds and convince a few patrons to support his work and research in arcane fields. What happened that day has been recounted so many times that the story has evolved. Bits and pieces were added and others exaggerated. But the core of the story is that Darthan borrowed six swine from a local farmer and placed them in a big wooden box in the city’s square. He wanted to use a refined form of transformation magic for his trick. If things had gone according to plan, he would have opened the box’s lid in front of everyone and six beautiful eagles would have flown out in magnificent form. But this did not happen. His spell failed and the transformation only occurred halfway. The pigs grew feathers and malformed wings. They were a hybrid mutant in between the two species. The swine did not survive the violent transformation, unfortunately. It goes without saying that Darthan did not impress any possible patron. He had to pay for the now useless dead animals and his reputation plummeted. Years later he became prominent when he claimed he could manufacture a flying vessel. He was the laughing stock of the city for weeks. No one believed it would happen but everyone was willing to attend if only to see him fail again. Darthan bought an old fishing cog, fixed it and moved it to his warehouse by the river. He had the southern section of the warehouses’ wall removed to let the vessel enter. After almost a year, Darthan announced that his flying ship was ready. A “first flight” ceremony was to occur within the week. Darthan had some people working for him but no one was willing to be on board when it flew for the first time. Even his workers remembered the fiasco of six years ago and did not want to become part of the next “tale”. The day of the flight, Darthan was alone on his vessel. It needed more than one person crew the vessel properly, but he had the sails fixed in place for a single flight in a straight line path. Just enough to demonstrate that the device worked and that it was safe to operate. Contrary to all predictions, the vessel performed well in its first flight. Darthan flew half a mile east and landed again on the river. The townsfolk were dumbfounded that Darthan had achieved it. “Could he possibly clean his name?” they wondered. Later that day, Darthan and his now more confident crew flew the device once more. This time Darthan could move around and did two circuits around the city. It’s been a week since that happened. People wonder when they will see Darthan’s Ship fly again. What only Darthan knows is that several powerful factions have grown interested in controlling the flying device and Darthan itself. The flying ship and the capacity to make more of them is something that everyone wants a part in. Darthan was recently approached by the military, the king, a merchant prince and a criminal guild. All of them expect everything from Darthan. The mage is now fearful for his life because any decision might entail repercussions from the other parties. He also fears that if he takes too long to decide, someone will try to attack his warehouse and steal the ship. Darthan is hiring mercenaries to guard his warehouse from a possible break-in. He received a threat letter yesterday that implies such a scenario. 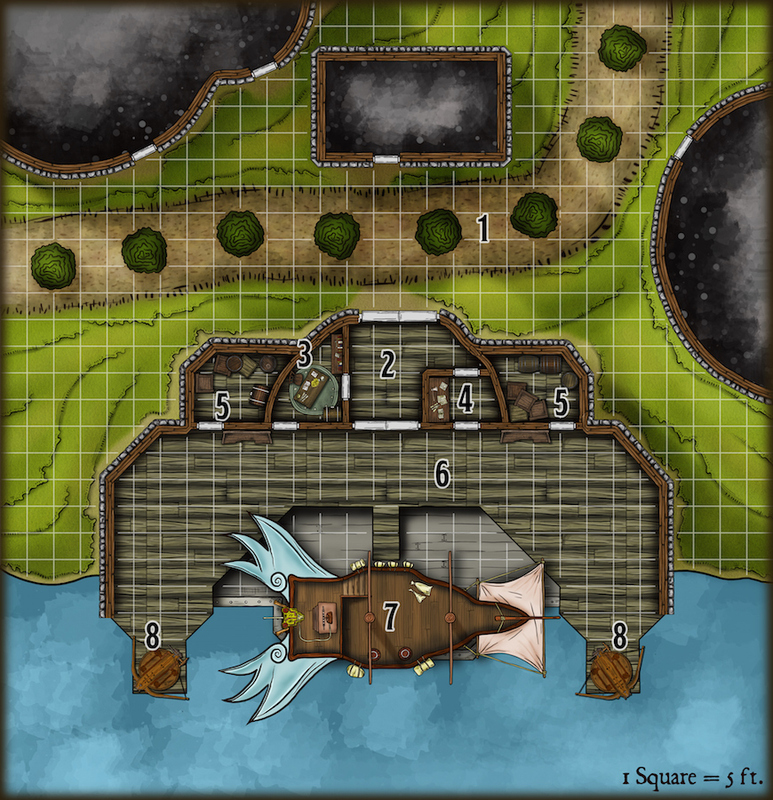 A criminal guild has decided the flying ship belongs to them. They hire a group of mercenaries to infiltrate the guarded warehouse and somehow steal the ship. Darthan has been offered a more secure location for his invention. To keep a low profile, he will sail west on the river to a better location near the capital. He needs guards for this dangerous trip. 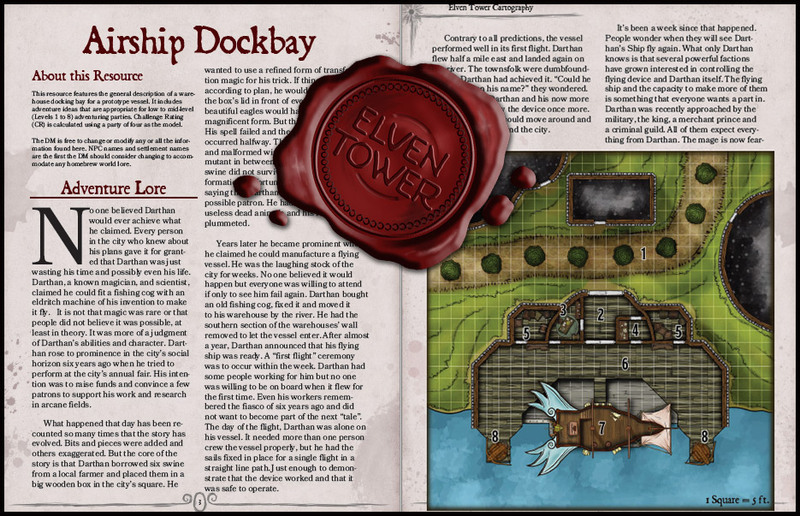 In exchange for a cut, Darthan is willing to fly the party to a difficult to reach location with his flying vessel. The warehouse is located on the outskirts of the city, just inside the city wall. The area has high desirability and lots of free space. Crow Street features a line of apple trees. This chamber is flanked by two sets of doors wide enough to let a -sized cart to go through. There are some crates in the room which are supposed to be there only temporarily. This room is littered with tools, copper tubes, non-described machinery, copper and iron bars, and engine parts. Darthan’s laborers spend hours here manufacturing parts from the raw materials. This is a more permanent storage room. There are crates, barrels, and chests lining the walls of this room. All containers are nailed shut. Most containers have Darthan’s old projects, or what remains of them. The workers joke that the bones of those six swine from the city fair are hidden in one of those crates, as a remainder of Darthan’s own ineptitude. The ship is roughly 45 feet long and 20 feet wide, not counting the wing-like sails on its back. The rudder mechanism has been replaced by an eldritch machine. The metal box features scores of small tubes and readouts that only Darthan understands. Below the device, two exhaust tubes emerge from the hull. When the ship flies, the exhaust is white colored. Whatever room was available under the deck, it is now completely occupied by Darthan’s device. The only usable surface is the main deck. Darthan redesigned these siege engines a few years ago. He did not make a breakthrough in their construction but found a way to make them a little more precise. His only real development being the aiming gears near the back. When he refitted his warehouse to house the airship, he placed his two working ballistae near the water. They look impressive but he has never used them to defend the warehouse yet. These are the general features of warehouse docking bay. The southern section of the building features no walls. It is open to the elements to allow for the airship to enter. Terrain. The warehouse has two levels. Bottom level features stone tiled floor. The top level is supported by wooden beams. The floor is made of wooden planks. No area is considered difficult terrain. Doors. All the doors are wooden. Two sets of doors are wide enough to permit a medium sized cart to go through. The rest of the doors are regular sized. All doors feature simple locking mechanisms. A character can use a set of thieves’ tools to bypass a lock with a successful DC 14 Dexterity check. Light. There are torch sconces in all areas within the warehouse. Workers light them as they are needed during nighttime. Smells and Sounds. The smell of wood and grease is prevalent in the warehouse. During daytime, it is common to hear the sound of engineers working with hammers and similar tools.